My Friend Tim Schoenborn took these photos yesterday while we were scouting for Colorado high country toms. We sometimes forget how cruel and unkind Mother Nature can be! 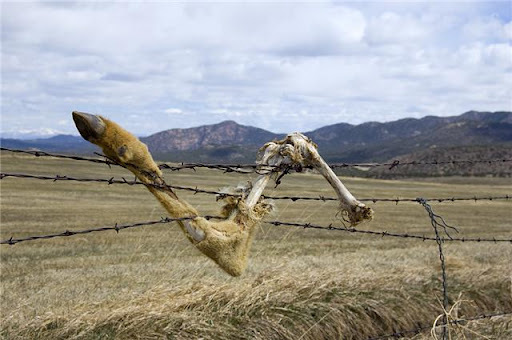 The Wet Mountains are shown in the back ground…this leg was found in the foothills of the Sangre De Cristos. Next Post >Turkeys Can Drive a Person to Drink…or Pull Your Hair Out! Shawn, That is one HELL of a way to die!.I can only hope that it was dead before the Coyotes found it.Good luck with the Turkeys.Scolopax. 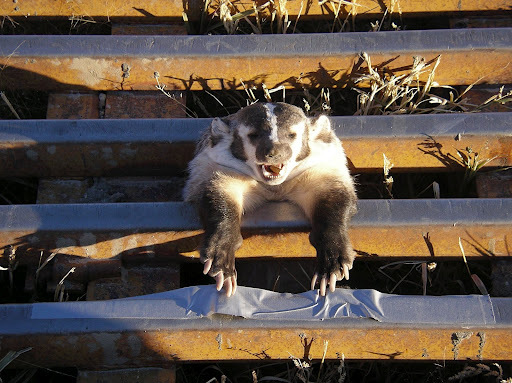 Shawn, You should have included the picture of the dead badger that we found stuck in the cattle guard a few years ago. You say mother nature is cruel, but these animals died because of man’s influence (i.e. cattle guard and barbed wire). It’s sad to see. On the other hand, for all of the headache, heartache, and hassle they have given me and my dogs over the years, I believe ever roughneck rooster pheasant deserves to die! I have no qualms with sending them back to their maker! hahaha. Andy:I just love the “cuk-cuk-cuk…BANG!” sequence when a rooster gets up and hits the turf. I’m with you–they are beautiful in life but my, oh my, they sure do look great on a platter.I also agree with the cattle-guard/barbed wire comment. I wonder how many antelope die every year in the Plains states because of the wire? On the other hand, something is needed to keep the beef corraled. Trade offs, trade offs, life is full of them. Steak also looks pretty good on a platter.To paraphrase Napoleon: “A birdhunter marches on his stomach.” From the looks of mine right now I’d better “march” some of it off before bird season. Man is the cruel one in this situation, the barbed wire and cattle guard is what caused these animals to die. Mother nature gives life, and the strong survive. Thats just the way life is. So why do tree huggers cry about people hunting? Animals are going to die no matter what, at least hunters can humanly maintain the population.